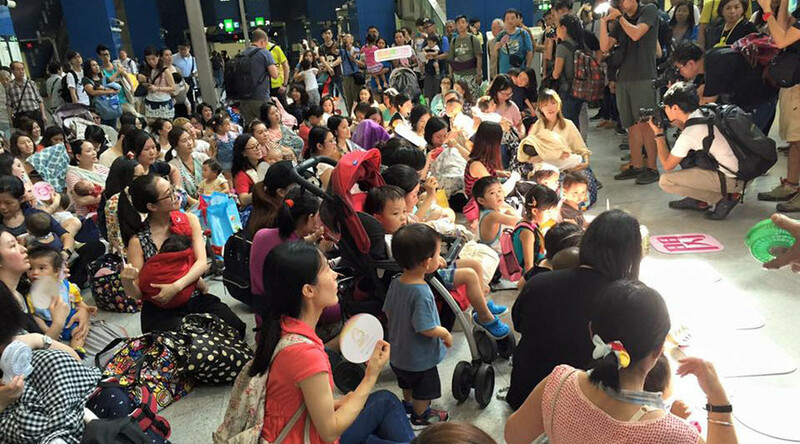 Around 100 breastfeeding mothers descended on a Hong Kong train station this weekend, feeding their babies in unison to protest discrimination against breastfeeding in public. The flash mob, organized by the breastfeeding support group MamaMilk Baby Alliance, took place Saturday at Tai Wai station. The group says breastfeeding mothers are being discriminated against in Hong Kong for feeding their babies in public, and are calling on the government to introduce legislation to combat the intolerance. A spokesperson for the group told the South China Morning Post that women in shopping malls, for example, are often asked to feed their babies in toilets. She added that most malls in Hong Kong do not have any dedicated breastfeeding facilities. “Despite there being a rise in the awareness of breastfeeding being the most healthy option for babies, many [mothers] face a lot of difficulties,” she said. This is the fourth year the group have organized such an event to raise awareness of the importance of breastfeeding. The World Health Organization (WHO) recommends that children are exclusively breastfed for the first six months of their lives. Only 2.3 percent of Hong Kong babies are breastfed exclusively until this stage, according to UNICEF’s Baby Friendly Hospital Initiative, but the breastfeeding rate is increasing. The WHO estimates that China’s healthcare system could save $223.6 million by preventing common childhood illnesses through boosting breastfeeding rates for infants aged under six months to 90 percent.